This year was definitely one of the hottest that we have had in a long time. With the high temperatures, I was on the lookout for a way to keep my pets cool and hydrated. After some searching, I found FrostyBowlz! This fun, innovative product is the perfect way to keep your pets cool! There are many reasons why I like this product. First off, the main bowl is stainless steal which is great! With pet bowls it is best to stick with stainless steal as plastic bowls tend to hold bacteria which can cause problems with skin irritations, especially for cats. 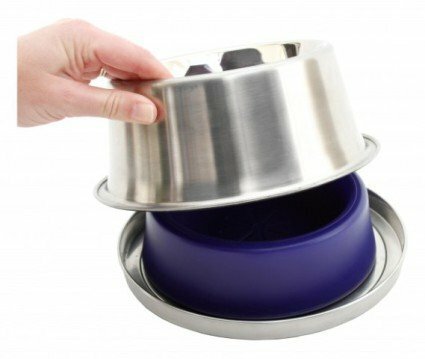 The way this bowl works is that you insert the freezable core (pictured below) into the freezer, once frozen, you stick the core on the bottom plate and place the stainless steal bowl on top. The cores keep the water or food nice and cold for 8-14 hours! This is great, especially for those that work. When you go to leave for work in the morning, you can take a Frosty Core out of the freezer, add the water and have a cold bowl of water for your pets all day long. I like having extra cores available and in the freezer at all times so it is easy to put a fresh one out when the other core needs to be put back in the freezer again. As you can see in the above photo, FrostyBowlz is dishwasher safe and non-toxic, which are two important features about products that your pets will be eating and drinking out of. This bowl is a good size for cats as well as dogs. I have one average size cat and one large breed cat and they both can drink comfortably out of it. This is also an ideal bowl for those who like to camp with their dogs. The bottom plate as an anti-ant barrier in which you can place water to keep ants out. FrostyBowlz is a wonderful product and one that I highly recommend for all dog and cat owners! Click here for more info on FrostyBowlz. Click here for more info on FrostyBowlz with additional Frosty Cores.